Trees suitable for small gardens must have a non-invasive root system. Evergreens will retain interest throughout the year, but what is not always remembered is that evergreens shed leaves throughout the year, unlike deciduous trees that shed their leaves within a few weeks and let in the winter sun. Tree wisteria (Bolusanthus speciosus) 7m x 4m, has a slender, erect shape, attractive bark and lilac-blue flowers in spring. Lavender tree (Heteropyxis natalensis) 6m x 5m, has lavender scented foliage when crushed, attractive bark, and a narrow growth habit. Foliage turns red in autumn. Forest bushwillow (Combretum kraussii) 7m x 4m, autumn foliage and a shady canopy in summer. 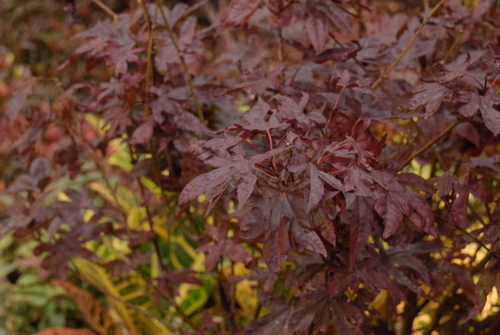 Japanese maple (Acer palmatum) has dainty foliage and rich autumn colour. Suitable for inland gardens. Tree fuchsia (Halleria lucida) grows 5m tall. Birds are attracted to the nectar-rich orange-red blooms and berries. Wild olive (Olea europaea subsp. africana) grey-green leaves, grows 6m tall and is water wise. Suits an indigenous and a Mediterranean style garden. Pompom tree (Dais cotinifolia). A fast-growing evergreen tree with a height and spread of 5m x 3m. It bears clusters of pink flowers in summer. White karee (Searsia pendulina syn. Rhus pendulina) 7m x 5m is a water wise, evergreen to semi-evergreen tree with a graceful growth habit, willow-like leaves and sprays of tiny greenish-yellow flowers. The ‘Meyeri’ lemon tree has a compact growth habit and bears juicy, smooth skinned fruit most of the year.